It’s time for the Secret Recipe Club again! I’m still in the midst of my elimination diet, and while I have added a couple of things back in, I worried this month that I wouldn’t be able to find a recipe from my assigned blog, Wendy Weekend Gourmet. But, Wendy has an amazing array of recipes. Just check out her recipe index! I immediately starting searching for veggie-riffic recipes, and I came across her Dynamic Side Dish Duo post. While I can’t eat potatoes yet, and I had to make a few minor adjustments to the roasted broccoli recipe, I knew reading it that it was the recipe for me. And, was it ever! Super yummy, easy, and so good for you – this dish is light and lemony and, with my modifications, both vegan and nut-free. Oh, and while Wendy might call this a side dish, I just call it lunch. Preheat oven to 400°. Toss broccoli with 3 T. olive oil and the garlic. Roast for 15-25 minutes. Remove from oven and toss with remaining ingredients. Serve! This entry was posted in basil, broccoli, grain-free, Italian, nut-free, side dish, sunflower seeds and tagged broccoli, nut-free, recipes, vegan. Bookmark the permalink. Yum! The addition of sunflower seeds to the broccoli sounds great! Great SRC pick! Our whole family just loves Broccoli, this recipe looks excellent! Thanks! Broccoli is one of my favorite veggies, too. Always good to add another way of cooking it to the repertoire. Love this way of doing broccoli! Great SRC pick! We love broccoli too! The sunflower seeds sound awesome on it! Yum! I’m always looking for new ways to cook our favorite veggies, and this could be one of them. This looks beautiful! Roasted broccoli is my favorite method for cooking the vegetable. I recently posted a roasted broccoli recipe using Old Bay and a bag of frozen broccoli. I love the idea of using sunflower seeds for a crunchy topping! And good luck on the elimination diet! I’ve just bought two heads of broccoli – I wonder what I should do with it? hmmmm:) this sounds delicious! I bet you had a terribly hard time pinning down a recipe to make from Wendy’s site. She has sooooo many good ones. Isn’t it crazy how roasting really changes the flavor of veggies? It really does. I love roasted veggies. Sounds like an amazing lunch to me! I eat several broccolis a weak right now, so might give this a try. Looks delicious! 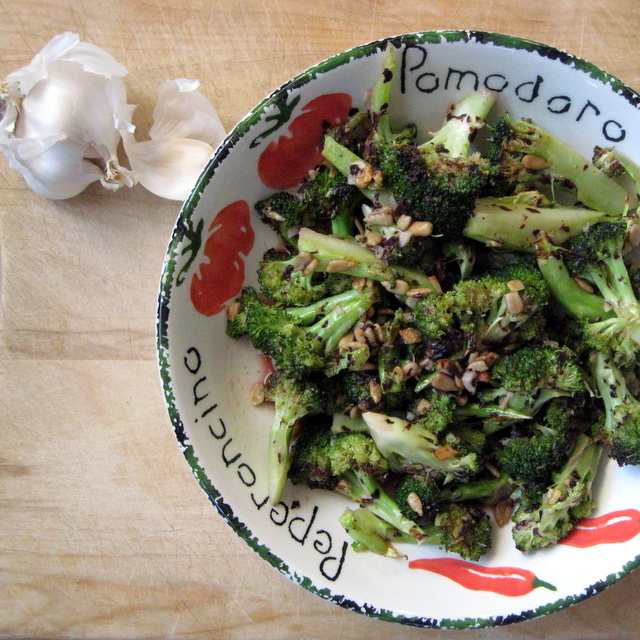 I have been going through roasted broccoli like crazy…this version looks great! I’ve had company the past few days, so my computer time has been scarce! I wanted to thank you for the kind words about my blog…you picked a really great recipe. The original recipe is from Ina Garten, who can do no wrong in my book!! Excellent! Let me know what you think. We eat a LOT of broccoli around here. It is one of my favorite veggies. I LOVE the sunflower seeds on this, super idea!